If 1931 had been grim for Canadians, hopes for a better 1932 were dashed immediately with the change of the calendar. Long lines of unemployed stood in soup lines in urban centres, farm families starved as drought ravished their lands, civil servants took pay cuts or even went unpaid altogether as 10.4 million Canadians struggled to make sense of a world gone awry. Intense heat, drought, violent dust storms and plagues of grasshoppers wreaked havoc on the countryside. Farm after farm was abandoned, indeed entire towns emptied out as the situation grew steadily worse. Factories closed as the call for locomotives, refrigerators, washing machines and hats dwindled to almost nothing. From Sydney to Victoria and thousands of places between, businesses failed. Traditional pillars of the economy, like wheat and pulp and paper, collapsed. Men and women drifted from town to town looking for work. Often they did not find any. More than 25 percent of the workforce found itself applying for relief (welfare). Hardest hit was the automobile industry. From a healthy figure of 203,307 passenger cars built in 1929, production dropped to 121,337 units built in 1930 and that was nearly halved again in 1931 as workers turned out only 65,072 units. The industry would suffer another blow in 1932 as production slid to a dismal 50,694 units. Ironically, American companies opened subsidiaries in Canada in 1932. Graham, Hupmobile, Hudson and Pierce-Arrow all christened assembly plants in or around Windsor, Ontario to avoid the 40 percent duty on automobiles imported from the United States. 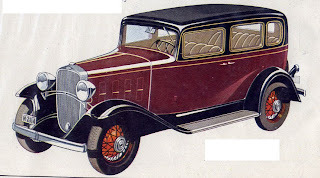 General Motors of Canada closed its passenger car factory in Windsor, Ontario in 1932. There was no need for the extra capacity. Automobiles could easily be supplied to the nation from its plants in Oshawa and Regina. GM Canada’s production had been strong at 104,198 units in 1929—more than half the industry's domestic total—but the following year it plummeted to 55,379 units. 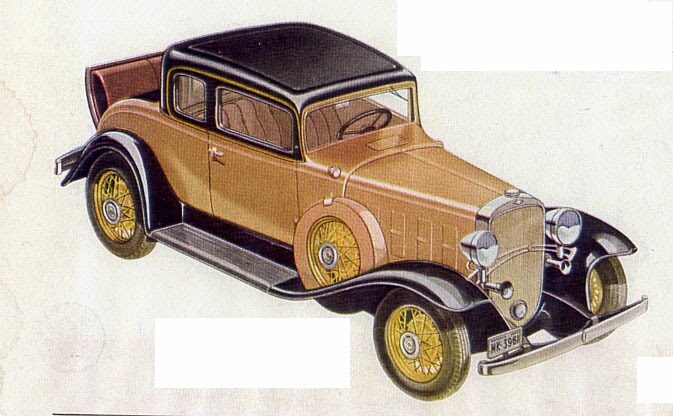 In 1931 the company’s total production of cars and truck skidded to 32,719 units and it would drop again to 19,565 units built in 1932. Against this dark economic backdrop, some of the most striking automobiles in history were built. The 1932 Chevrolet lineup was breathtakingly beautiful—all glitz and glamour. A full baker’s dozen—one more than our American cousins got--all in the Confederation series, was offered to the public. The press noted that this year's crop of Chev's all bore more than a passing resemblance to its ritzy cousins in the Cadillac line. 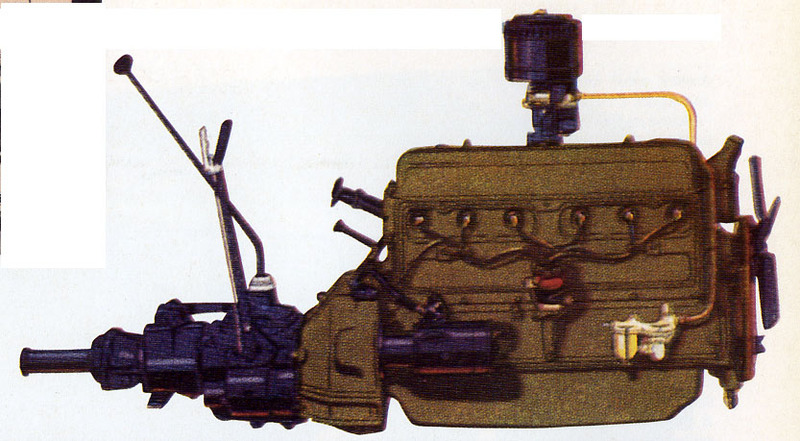 This year the Chevrolet’s 60-horsepower mill was emphasized heavily in advertising in a bid to compete more favourably with Ford’s new V-8 engine. The 20 percent increase in power from the bowtie camp wasn’t enough to steal Ford’s thunder—The blue oval’s flathead cranked out an extra five horsepower. Advertising boasted Chevrolet’s 21 “Points of Superiority for 1932.” These included a smooth, six-cylinder, 60-horsepower engine; 65 to 70 miles per hour of acceleration; silent Synchro-Mesh gear shifting (new this year); powerful, long-wearing brakes on each wheel; an easily adjusted driver’s seat; a non-glare windshield and a variety of beautiful Duco colours but to name a few of the virtues touted. The marketing department in Oshawa decided to tie Chevrolet's image to fine art and at the same time appeal to the heartstrings of patriotism. 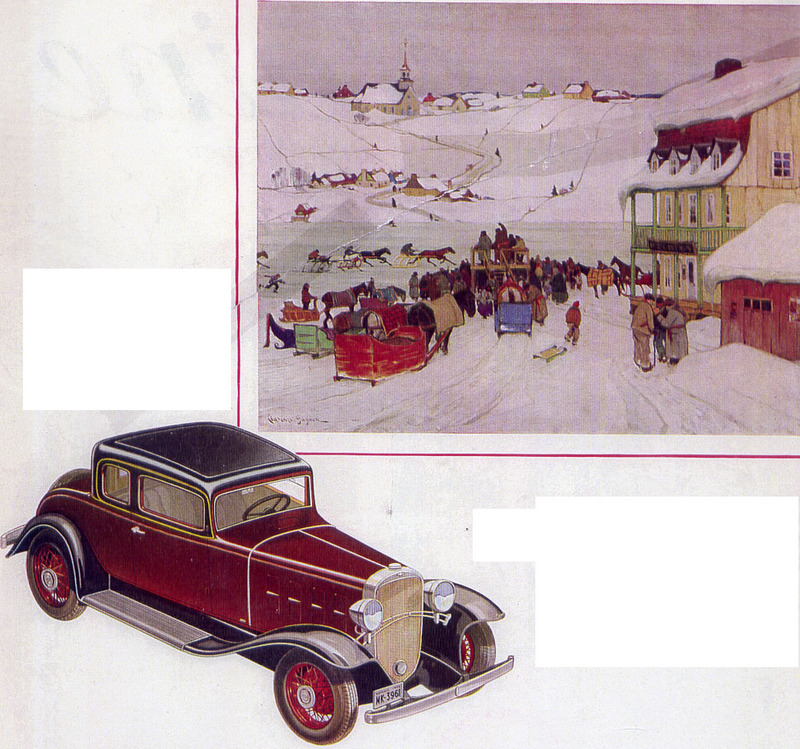 A series of full-page, full-colour ads linking Chev to famous Canadian paintings appeared in magazines, including Maclean’s and Chatelaine. 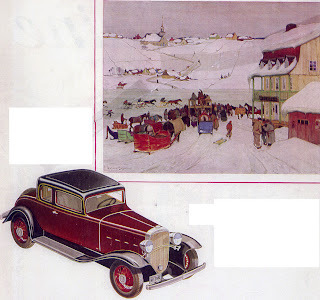 Billed as the “Queen of Values in Old Quebec,” ad copy read, “In Canada the name Chevrolet Six has always meant, in both French and English the smart type of economical transportation. At the recent Montreal Motor Show, Quebec’s elite—must cultured of moderns—paid liberal compliment to the genuine character and beauty of this fine car and to the certain air of quality which sets it head and shoulders above others in its price class. The highways and charming byroads of Old Quebec offers ample evidence of the new Chevrolet’s great popularity.” Shown side by side with the stylish automobile was the painting Horse Racing in Winter, a scene from a small town in Quebec along the St. Lawrence River, rendered by internationally renowned artist Clarence Gagnon. "Pioneering Mountain Trails" and “Admired at Smart Resorts,” Chevrolet was noted as being a regular part of life in Alberta. “Along the foothill trails of Canada’s Rockies, where gasoline pumps are few and far between, you notice many Chevrolet Six. Around the lodge at Jasper, too, you’ll find that Chevrolets are very much in evidence. For Chevrolet has definitely proved that Canada’s most economical car is also strikingly smart, quality built and thoroughly modern automobile.” The car with Body by Fisher and the Free Wheeling was paired with Mount Robson from Lake Berg, a stunning landscape by Lawren Harris of the Group of Seven. “Proved on the testing ground of a nation’s roads and byways” was another in the advertising campaign. “A hundred thousand owners of low-priced cars throughout Canada were invited recently to tell what they through was Chevrolet’s most important story. Like a recurrent theme through thousands of entries received was this conviction—Chevrolet leadership is based on the goodwill of the men and women who have tested the Chevrolet Six in millions of miles of driving.” A truly bucolic landscape was featured with the car, one entitled, An Ontario Side Road, painted by Fred H. Brigden. Each advertisement boldly announced that the Chevrolet Six was produced in Canada. A young man by the name of Foster Hewett began to broadcast a programme called Hockey Night in Canada—sponsored by General Motors of Canada, Limited. At the time, no one knew that the sportcast would become the most popular programme in history or that Foster Hewett would be the voice of NHL for nearly fifty years. Despite all the hype Oshawa could muster, Chevrolet passenger car production slipped from 17,867 units in 1931 to an absolutely abysmal 10,832 units built in 1932. Fortunately, the corner had turned and production would increase in 1933. What a fascinating piece. I enjoyed reading the history that added to the wonderful images no end. Thanks for going to so much trouble to provide such info for those who love vintage cars!